High school graduation is a very, very big deal. It’s the culmination of more than a decade of hard work and dedication by the individual students and their network of teachers, peers, and family. But for many homeless high schoolers, it’s a difficult goal to attain. Thanks to the tireless support of district employees from the North Thurston Public Schools Homeless Education staff, graduates are not only accomplishing their goals, but surpassing them. 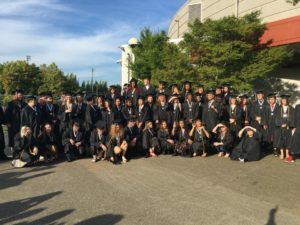 “While the statewide graduation rate increased between 2011 and 2016, the countywide graduation rate decreased, falling from 80 percent to 76 percent,” the Thurston Regional Planning Council reports. Their surveys and census data also found a 10 percent increase in homeless public school students during the 2016-17 school year, which is equal to about 149 students. 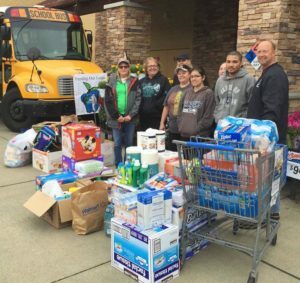 Within the North Thurston Public Schools (NTPS) district, Homeless Liaison Brenda McAferty and her team strive year-round to match homeless students with resources, organizations, and groups to help them succeed. McAferty explains that the North Thurston district has approximately 850 students who identify as homeless and a significant number of those are considered “unaccompanied homeless youth (UHY),” usually high schoolers couch surfing with sympathetic friends. After determining eligibility for services, they do their best to insure there are no barriers to the student’s education by helping arrange daily transportation, school supplies, and access to free breakfast and lunch programs. This year, the team added two student navigators to focus on these unaccompanied students as well as those experiencing homelessness with their families. The navigators connect individuals to community resources, food stamps, health care options, and even aid in filling out the FAFSA financial aid forms. “That is a huge support for these kids,” says McAferty. And it’s paying off. A large percentage of McKinney-Vento seniors are not only graduating this year, but have established post-graduation plans. In the class of 2018, of 79 homeless youth, 59 of those were unaccompanied. The group has a 75 percent graduation rate and 41 will be attending 2- or 4-year colleges, 5 are joining the military, and 8 are entering trade school or apprenticeship programs. McKinney Vento graduates together earned more than $150,000 in future scholarships because “they’ve worked really hard,” says McAferty proudly. And it’s truly a team effort. “We live in a very giving, compassionate community,” says McAferty, with some of the biggest partners being charitable organizations across the region. The Family Support Center, Community Youth Services, Thurston County Food Bank, and Homeless Backpacks are dedicated partners. With their help, NTPS gave out more than 30,000 bags of supplemental food this year alone. These bags provide extra meals over weekends and holidays when school cafeterias are closed. Saint Mark’s Lutheran Church in Lacey also offers a Clean Kids Laundry where McKinney-Vento students have an exclusive time-slot to wash their clothes each week. The church staff generously provides all soaps and supplies. One of the largest partners is the North Thurston Education Foundation. “They do an exceptional job,” says McAferty, helping with funding, school fees, and scholarships. This year over $120,000 was offered to graduating seniors in need. But more than that, the NTEF helps with the little things that make high school so memorable. Thanks to their generosity, all McKinney-Vento seniors receive their cap, gown, and yearbook at no cost to them. 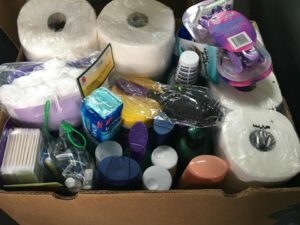 The NTPS Homeless Assistance team gladly accepts donations of gently used clothing, supplies, and hygiene items and can point anyone interested in helping to one of the numerous organizations in our community who help those in need explains McAferty. Their offices are closed for the month of July each summer, but kick into high gear when August rolls around. Should you have questions about their programs or want to help, email bmcaferty@nthurston.k12.wa.us and she’ll help you find the right fit. High school is hard enough without the added burden of not knowing where you’ll sleep each night or if you’ll eat the next day. Any little bit can help a student on the road to education, graduation, and future success. Contact Brenda McAferty and her team for ways you can do more.